ASHTANGA YOGA is a form of yoga in which breath and movement are synchronized through a sequence of poses. Movement through the sequence of poses, coupled with the breath, generate heat, thereby producing sweat and purifying the body by releasing toxins. Benefits: Ashtanga Yoga deeply stretches the entire body, balances and purifies the physical body, and improves mental concentration. It stabilizes the nervous system and supports both physical and mental wellbeing. The practice brings immediate physical and mental changes with the physical changes being more readily apparent: the body tones and the muscles strengthen. The practice of Ashtanga Yoga improves one’s concentration, vitality and energy, from which one establishes a healthy and awake state, both physically and mentally. With time, the practice helps to release tensions, relax the mind, reduce stress, and balance the metabolism, thereby significantly improving the digestive process, circulation and sleep. There are certain aspects that you should learn and will learn little by little with your practice: trishtana, asana, breathing, dristhi, vinyasa and bandhas. This means three points of attention during practice: pose (asana), breath and gaze (dristhi). These three points are very important in the practice of Ashtanga Yoga as they correlate to three levels of purification: the physical body, the nervous system and the mind. They are always practiced in conjunction with each other. In the beginning it may be difficult to pay complete attention to these three points, but it comes with time. Attention on these three points facilitates meditation in movement, making us more conscious of the present moment. Asana means pose. Asana purifies, strengthens and increases flexibility of the body. The poses should be done methodically with proper alignment. Each pose should be perfected prior to beginning the next one, thus slowly, but surely, increasing one’s strength and flexibility and improving one’s health. Too many asanas too soon can be damaging, so the teacher is the one who decides when each student gets the next pose. One should breathe only through the nose. Inhalations and exhalations should be of equal length. The breath should be fluid and without interruption, emitting a whistle-like sound from the base of the throat. Deep breathing with sound activates the digestive fire that heats up the lower abdomen and helps purge the body of toxins. Breathing this way purifies the nervous system. Dristhi means gaze. Each asana has a corresponding gazing point. If the indicate dristhi for a pose is very difficult, we can always gaze to the nose. With time and practice, one can follow all the dristhis. By directing the gaze to one specific point during practice, we avoid distractions and are more present in each moment. Nasagra drsti: towards the nose. Brumadhya drsti: towards the third eye. Nabhi drsti:towards the belly button. Parsva drsti: towards the left. Parsva drsti: towards the right. Hastagra drsti: towards the hand. Angusta drsti: towards the thumb. Padagra drsti: towards the toes. Vinyasa means synchronization of breath with movement such that each movement begins and ends with the breath. For example, in “Suryanamaskara A”, there are nine vinyasas. The first vinyasa is inspiring while raising our arms towards the head with our palms together. The second vinyasa is exhaling while we fold forwards and down, putting our hands next to our feet. This way, all the asanas are assigned a certain number of vinyasas. The purpose of this method is internal purification. Practicing breath with movement warms our blood and circulates more easily between our joints and internal organs, thereby eliminating impurities from the body through sweat. With the vinyasa method, the body becomes more pure, healthy and strong. Only after the purification of the body is purification of the nervous system, the organs and senses possible. These first steps are very difficult and require years of practice. The organs and the senses are always seeking externally, and the body tends to be lazy. Regardless, with determination and disciplined practice, these two tendencies can be controlled. The mind control will come automatically. Vinyasa creates the base for which this may occur. It is important to keep in mind the number of vinyasas may not be possible at first. In the beginning, extra breaths may be necessary as long as they are still tied to movement. With time and practice, the correct vinyasa for each pose will be possible. The bandhas are energetic locks that are created on a physical level by contracting certain muscles, thereby maintainingprana (vital energy) within the body. This creates more internal force which is very useful for more difficult poses, support the vertebral column and increase respiratory capacity. Mula bandha: The contraction of the pelvic floor, or more concretely the deep transverse perineal muscle. Mula means root. Uddiyana bandha:The elevation and contraction of the lower abdominal muscles (just below the belly button), strengthening the lumbar area. 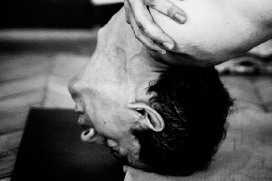 Jalandhara bandha: Consists of bringing the chin towards the chest with the tongueto the roof of the mouth. This prevents prana from leaving through the mouth and nose. Beginner´s Course: You have two options to learn the basics. Beginner’s course:The beginner’s course consists of two Mysore-style classes during the week within thirty days after your first class. The weekend beginner’s course: consists of a 1.5 hour class on a Saturday and another 1.5 hour class on a Sunday in which we learn the bases and method of Ashtanga Yoga. Ashtanga yoga is a system of postures initially developed by S.T. Krishnamacharya and then evolved – at a global level – by one of hisalumni, S.K. Pattabhi Jois.